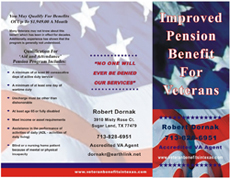 We are not associated with any government agency and cannot guarantee eligibility nor monetary compensation from VA Programs. Federal law dictates that no one may charge a fee to help in the preparation, presentation or prosecution of a claim for VA benefits. Furthermore, only individuals who are accredited can be involved in the preparation, presentation, or prosecution of a claim for benefits. We provide information about the aid and attendance benefit including what it is, who can qualify and what information and documentation are necessary in order to file a claim. Individuals who are accredited veterans service organization representatives can also assist claimants with the filing of a claim. For all other instances, veteran households seeking help with filing a claim are directed to an appropriate veterans service organization or to a state or county veteran service representative or, where appropriate, they are encouraged to file a claim on their own.